As anyone who has ever rented a Parisian apartment—even for just a short stay in the City of Light—knows, one of the true pleasures of non-hotel living in Paris is the views over the city’s iconic rooftops. The hundreds of tiny clay chimneys. The ornate sloping roofs adorning ancient stone buildings. The skylights and wrought-iron balconies peering out over the entire scene. 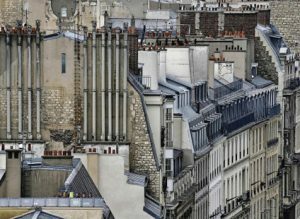 And now, a photo exhibit staged at Paris’s La Galerie Particuliere, located in the artsy Marais, celebrates those picturesque canopies. 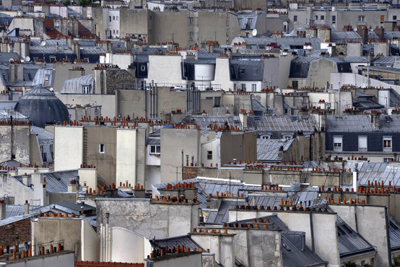 Renowned German architectural photographer Michael Wolf (who resides in Paris and Hong Kong) spent much of the summer and fall of 2014 visiting dozens of high vantage points throughout Paris to snap images of the city’s unique rooftops, from the zinc gables made popular in the 19th century to the dense patterns of chimneys seen throughout Paris’s residential quarters. 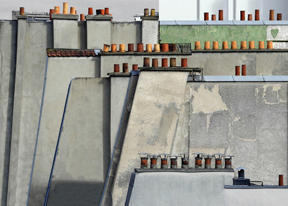 The results are displayed in “Blind Walls-Paris Rooftops,” an exhibit staged through March 1. Wolf began his photography career in 1994 as a photojournalist, working for the German magazine “Stern” from its Hong Kong Office. He won first prize at the 2004 World Press Photo competition for his photos that accompany an article titled “China: Factory of the World.” In 2003, Wolf shifted his focus to only fine-art photography projects. During the past year, Wolf has had exhibits staged in London; Shanghai; New York; Zurich; Frankfurt, Germany; Berlin; The Hague, Netherlands; Cincinnati, Ohio; and Rovereto, Italy. Paris’s La Galerie Particuliere was founded in 2009 by Guillaume Foucher, a graduate of the Ecole du Louvre, and Frederic Biousse, a couture fashion house executive. The gallery showcases contemporary art and photography. 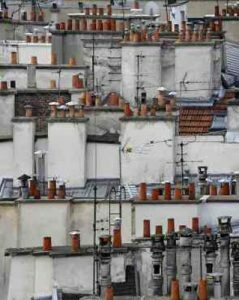 “Blind Walls-Paris Rooftops” will be displayed through March 1 at La Galerie Particuliere, 16 Rue du Perche in the 3rd Arrondissement (Metro: Saint Sebastien-Froissart). Admission is free. The gallery is open Tuesday-Saturday 11 a.m.-7 p.m., closed Sundays and Mondays. This entry was posted in Art, Beauty of Paris, Marais, Museums and Galleries and tagged La Galerie Particuliere, Michael Wolf, photography, rooftops by Bob Adams. Bookmark the permalink.